Can amateurs benefit from a coach? In one of the numerous books I read on training I often heard about the benefits of having a coach. My first reaction as is probably yours is why would an amateur need a coach? Are they not for professional athletes? Having completed several marathons I generally consider myself as having a good understanding of endurance training but with triathlons i’ve found the complexity of the training increase a lot. By combining three disciplines and increasing total training days to 6 days a week (~10-15hours) a detailed yet flexible plan has been very beneficial. So to get back into training i’ve now been working with James at http://www.triathloncoaching.uk.com/ for the past month. The approach is quite straight forward 12.50 GBP/ week for unlimited email support and a week by week review of my training and progress. James has been helpful with all my various questions from nutrition to morale support during my training. With my sometimes unpredictable schedule with work it was important for me to have a flexible training program that adjusted based on my work out completion and also what disciplines I could do each week. The online system they use allows me to change each day based on what I am able to complete. For example if the original plan had a cycle mid week but i was travelling I can easily shift it to another day. The coaching benefit is that each week my following week program is revised based on my performance and progress thus far. @12.50GBP a week it is quite an affordable program compared to most other services and so far a worthwhile investment in keeping me on training. It’s an efficient service that suits amateurs who are looking to complete their first long distance event. Check out their services at http://www.triathloncoaching.uk.com/ if you are interested! Finally – a great interval/ lap training venue nearby! After 3 weeks finally got back on my bike. This morning to celebrate a fellow biker’s birthday we woke up at 4:45AM for a 5:30AM start on circuits. 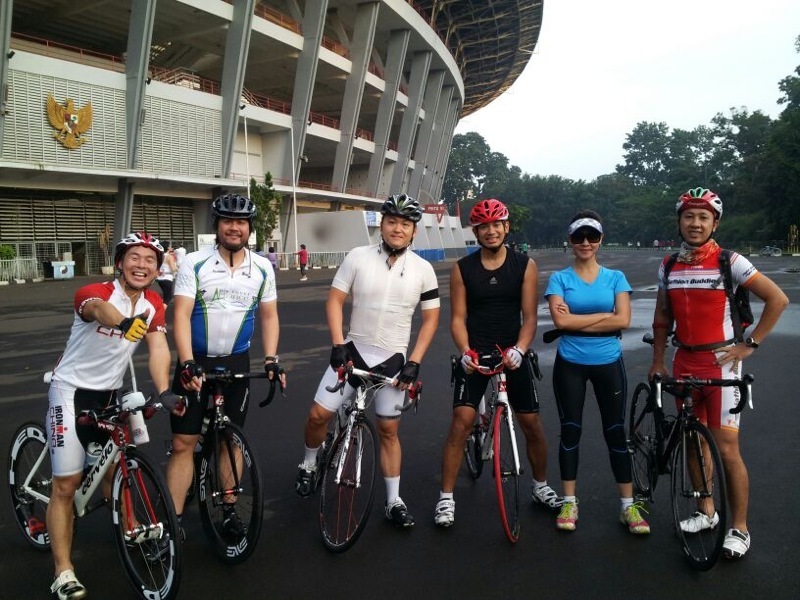 The plan was to cycle around Senayan stadium – approximately 800M a loop – doing interval sets. 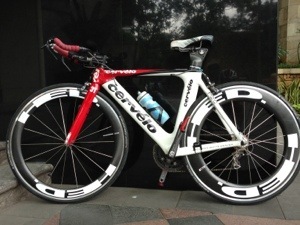 During speed sets HR went above 180 averaging speed of around 33km/h. A loop took approximately 1 minute 33 seconds. However as yet i could not break 1 minute 30 seconds for a single loop. Later we went outside the stadium area to do loops around the carpark. Despite the lack of planning and structure it was a great discovery to find somewhere in the heart of Jakarta for some good interval training. Come March this will be at least a regular weekly visit for interval sets! Today I attempted to swim a short 1KM but seem to have developed something of a swimmer’s elbow! Every pull on my right stroke results in a pain on the inside of my right elbow. I researched a bit online and it seems like it could be something like Golfer’s Elbow or “medial epicondylitis”. From what I can remember I developed this after I have tried cultivating a deeper catch with my arm. Potentially this is a technique issue and based on the research online I need to recruit more of my laterals and back muscles in order to propel myself versus using my arm and forearm muscles. Later today i’ll give it another go! That said these last 3 days were spent with my brothers at his 30th birthday celebration in Phuket. Insanity every day, lots of eating and swimming in a gorgeous 25m pool at a villa we stayed at. Tomorrow I have my first skype session with a potential Triathlon coach. It seems that while 12 months is a long time away it will pass very quickly so I need to get my training in gear! After my weekend performance at the sprint tri I’m now regretting experimenting with the no socks on the run strategy. With the backs of my ankles still raw from the chaffing I’ve been unable to do any exercise for the past 4 days until they heal properly. Everytime I try stretch the cuts break open again! None the less I’m hoping to recover by the weekend when we have another OD training session lined up! So may as well take the opportunity to rest up and wear slippers into the office! How to insanely kick start 2013 fitness! Last year I tried out the Insanity training program. Developed by the fitness fanatics at Team Beachbody in conjunction with veteran fitness instructor Shawn T., the program has promises to “reinvent your body” in just 60 days. Last year I only managed to get through half of the program (before being overwhelmed with getting married, moving countries and starting a company) however even with only half of the program I already started to see some results. 1) SUPER CONVENIENT: You can do it ANYWHERE: all you need is a 3mx2m space to move around it, no equipment, no special room required. 3) SUPER EFFECTIVE: Every 2 weeks you’ll do a fit test where you’ll do 8 exercises and if you follow the plan you cannot fail to make significant improvements. So where’s the catch? It’s tough. I would not recommend the program if you don’t have a base level of fitness. Also while it is convenient it requires a major commitment. Training happens every day except Sunday. I’m using insanity to kick start my 2013 – the beginning of the year is the easiest time to go off course on your goals. Before any new habits a formed and you are getting out of holiday mode. So I’ve found the best way to get into the right mode is to make things as easy as possible to get back on track. Check out my insanity progress at the link below. Old age, lack of legs poor or health didn’t stop any of these heros from finishing and inspiring others to get up, get out and do something. 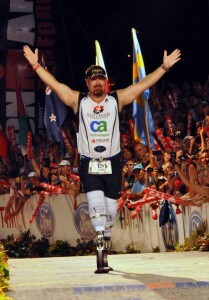 To complete an Ironman is a life long ambition and goal. It’s not something new to me but it has remained elusive in its accomplishment. I first heard about Ironman triathlons when I was watching ESPN in my hotel room while on holiday. I was in awe, shock and emotion by the sheer courage and dedication of a competitor who was over 60 and promised her late husband to complete the Kona Ironman on a bike which he had left to her. Later at Stanford one of my class mates was a real life Ironman competitor and hearing him talk of the hours and hours of training he had put in to complete the most amazing race in the world fueled my interest. Finally over some festive Christmas drinks in 2005 my house mate and I decided to enter the UK Ironman to be held in August 2006. 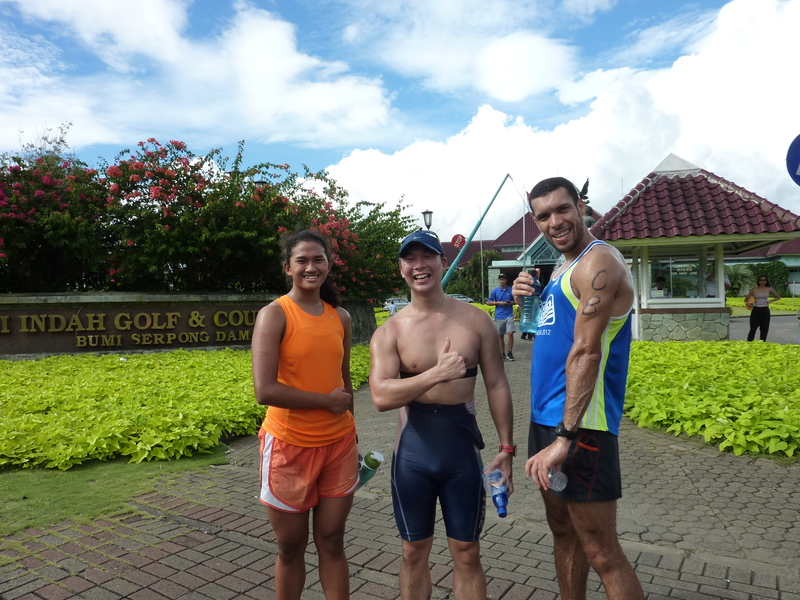 We gave up 7 months of alcohol, late night partying and put in hours of swim training, cycling and running in preparation. Then in july just a month away from the event I crashed my bike broke my wrist. I ended up at the Stanford hospital where the doctor reassured me that they could “pin” my wrist together so I could compete in the race. I kindly declined the US$10,000 option instead choosing to go on holiday in Thailand and nurse my broken wrist. Just as well because there was no way I would have kept up with my house mate Geoff who would go on and finish the event in under 13 hours. 4 years later I would line up to the start of the Hainan 70.3 (Half Ironman) and complete the grueling event in 6 hours 43 minutes. Despite my elation at completing the event all I could think of was doing “the real thing”. Fast forward to 2012. I now have several Olympic distances under my belt, a handful of marathons and a 70.3. After many years of talk it’s time to give it another shot. This time I’ll have a great friend Tevis joining me in this epic journey of a year of training culminating in 3.8KM of swimming, 180 KM of cycling and 42 KM of running – hopefully finishing in under 17 hours to the Ironman classic words of “Adrian Li – YOU are an Ironman”.